A new sweets shop on Madison Avenue touting a line of "candy for grown-ups" already has a waitlist of 350 people looking to be the first to try the store&apos;s upcoming rosé flavor gummy. UPPER EAST SIDE — Rosé fans, get in line. A new sweets shop on Madison Avenue touting a line of "candy for grown-ups" already has a waitlist of 350 people wanting to be the first to try the store's upcoming rosé flavored gummies, according to store offiicals. Sugarfina opened at 1100 Madison Ave. near East 83rd Street on Wednesday, with a cornucopia of non-alcoholic cocktail-inspired gummy candies, including champagne, spiced rum and cola and peach bellini. 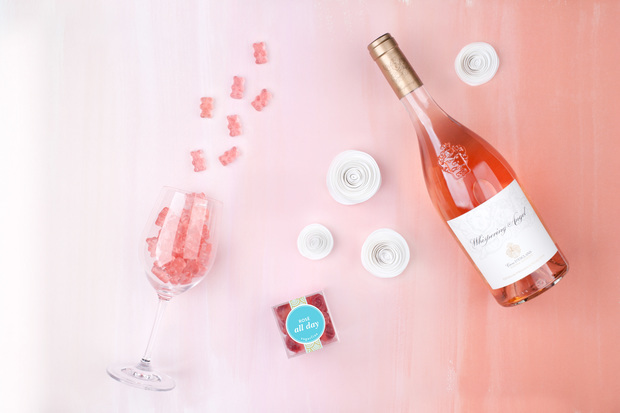 The rosé flavored gummies will be infused with Whispering Angel Rosé and come in a "Rosé All Day" gummy bear version and one in a rose shape called "Yes Way Rosé," according to Annie Worthington, a spokeswoman for Sugarfina. Both are still being developed, and are expected to debut June 30. "Sugarfina candies are unlike anything sold anywhere else — 75 percent of our collection is exclusive to Sugarfina and can’t be found anywhere else in the U.S.," said co-owner Rosie O'Neill. The store features 130 different types of candies — including chocolates shaped like martini olives and marshmallows dipped in 24K gold. One area is dedicated to "top shelf" candies that come from around the world, including interlocking chocolate wedding rings from Greece, Italian gummies made with rosewater syrup and Japanese hard candies in the shape of flowers, the spokeswoman said. Candies of one kind can be bought in bulk, or customers can create their own assortment with the store's "bento boxes," Worthington said, noting that the store also offers two free daily samples. The candies are all labeled kosher, vegan, gluten-free, fat-free or all-natural. Owners O'Neill and Josh Resnick, who formerly worked for Barbie and for a major video game developer, respectively, opened their first Sugarfina in Beverly Hills. They plan to open 16 more stores across North America, not including 12 kiosks in various Nordstrom stores, by July, the spokeswoman said. A second Manhattan shop will open at the World Trade Center in August, she added. "Many of our shoppers are coming from the Upper East Side, so it was only natural to open a location right in the heart of this vibrant community," O'Neill said. Cheers to all the sweet Dads out there! ? If you still need a last-minute gift, visit one of our boutiques for Dad-approved treats like Pale Ale Pints gummies ?